This edition presents 12 images accompanied by poetic text describing the use of common buttons in different cultures over the last 100 years. These are buttons as they were not intended to be worn-none of them function to keep garments closed. Each example is depicted with an embossed relief print printed on an etching press, a sort of bas-relief in the sense that the images, and the buttons, are raised, not recessed in order to best recreate the original object or textile. A novel technique was devised in order to do this, and to reproduce the extremely fine textures in each example; those of wool, felt, cotton, leather, feathers, horsehair, and embroidery. Normally, the textures would be collaged onto the printing plate to make what is known as a collograph. In this case, a cast or mold of each image was made by pressing the textures and buttons momentarily into sheets of plastic modeling clay, flattened out into rectangles by the artist. Then the plastic was hardened in the oven, just as real plastic buttons, the most common by far, are formed through heat with molds, creating a symbolic relationship between the work of art and the buttons of which it speaks. Each image is bound with a thread and two buttons to a piece of stiff cloth, with rhyming text created by hand and sewing machine in buttonhole stitch. The colors of thread used and complementary stitching all relate to the material culture of each place. The letter “O” throughout the text is represented by buttons similar to those used in the original context, which means there are roughly 50 buttons sewn onto each work. A stitch in time saves nine perhaps-there are nine copies in this edition-but with the help of the artist’s sister-in-law Anna Figliomeni much time was saved sewing the text. 1. On a wooden Uncle Sam with a hat of tin can – American folk art sculpture from the National Museum of American Art, Hemphill Collection. Button inlaid in wooden neckwear. 2. On a Naga carving’s ears where shells would appear – Miniature wooden figure with buttons attached to ears. Naga hill tribe, Northeastern India. The buttons imitate shell decorations worn by tribespeople. 3. On Lur children with charms meant to keep them from harm – Boy’s hat from Luristan, Western Iran, now in the National Museum of Denmark. Buttons and other trinkets attached to the hat served to aid and protect a boy of the nomadic Lur tribe. 4. On Woodabe boys at the Geerwol hoping to be the belle of the ball – Headgear from photographs of young Weedabe men, Niger, during the Geerwol dance, a coming of age ceremony. The young women select the most beautiful man of all, judged partially by his tight feminine clothes, make-up, and glitzy baubles, including buttons. 5. On a Bedhouin camel headstall lest danger the camel befall – Nomad camel halter adorned with Arabic coins, cowries, tassels, and buttons to ward off evil from the Museum of Mankind, London. 6. 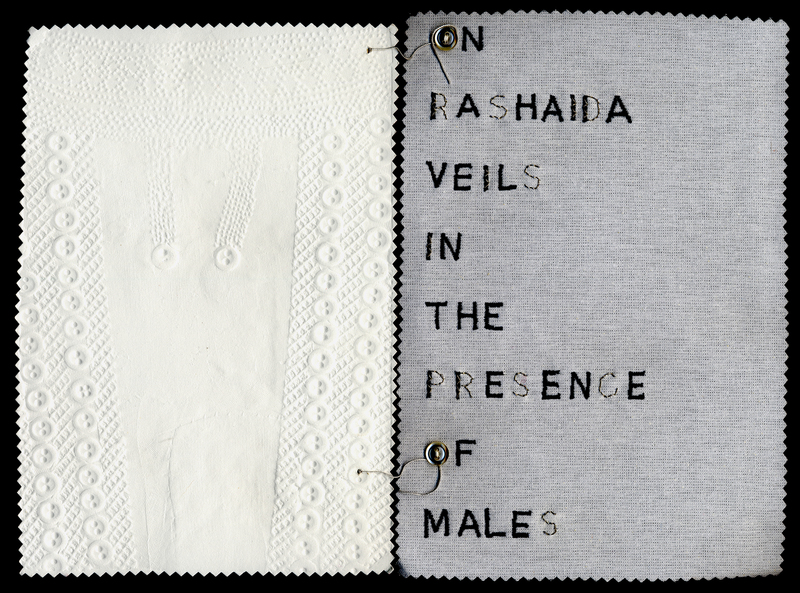 On Rashaida veils in the presence of males – Veil from a photograph of a female Rashaida nomad, Eritrea-Sudan border region. The black cloth veils are always decorated with silver embroidery, buttons, and sometimes, silver charms. 7. 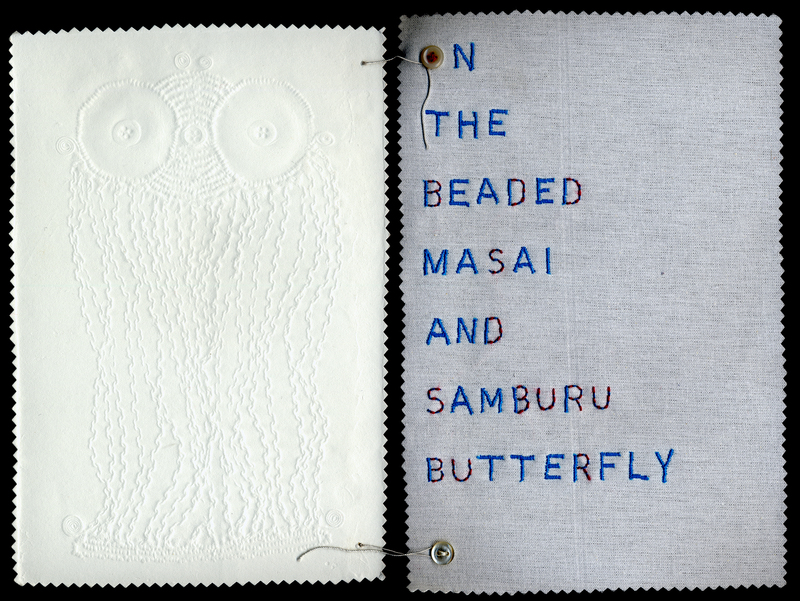 On the beaded Masai and Samburu butterfly – 19th century pectoral with iron chains, porcelain disks and buttons, Kenya. The Masai and Samburu, related tribes, are known for their copious bead ornamentation, almost invariably with buttons attached. This image shows that button decoration is an age-old tradition for them. 8. On a Zulu apron adorned to protect the unborn – Detail of a Zulu pregnancy apron, South Africa, from a photograph. Bits of fur, leather, beads, buttons, and cloth are intended to protect the developing child. 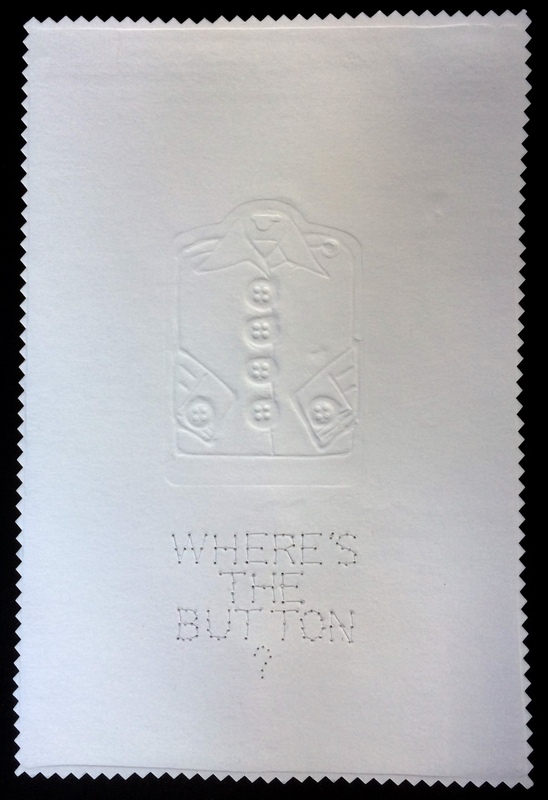 This image is also repeated after the title page, adding a mysterious response to the title’s question, “Where’s The Button?” as well as creating a divider between the title and the body of the work. 9. On button kings and queens in shiny togs to be seen – The Pearly Kings and Queens of England, who once functioned as costermongers, or people who hawked their wares along the streets, have suits encrusted with buttons from head to toe. Here a jacket cuff and sleeve are reproduced from a photograph. 10. On a blanket with coppers motif, wrapped around a Kwakiutl chief – Detail of an Edward Curtis photograph showing buttons being used in a symbolic way among the Native Americans of the Northwest Coast. Each repetition of the motif pictured signified a real copper sculpture with a specific monetary value, which was contributed at a Potlatch ceremony, allowing the chief to display his wealth and prestige. 11. On the leggings of hill tribes in which an Akha girl strides – Reproduced from a photograph of young Akha women from Chiang Mai, Northern Thailand. 12. On the pouch of a Rabari groom with betel for guests to consume – Small purse of Rabari shepherd nomad, Western India, used to distribute betel nut to wedding guests in thanks for contributions a few days prior to the wedding. Index. Printed with the same process, to seem as if it were handstitched on cloth. Titles of plates with numbers 1-12. 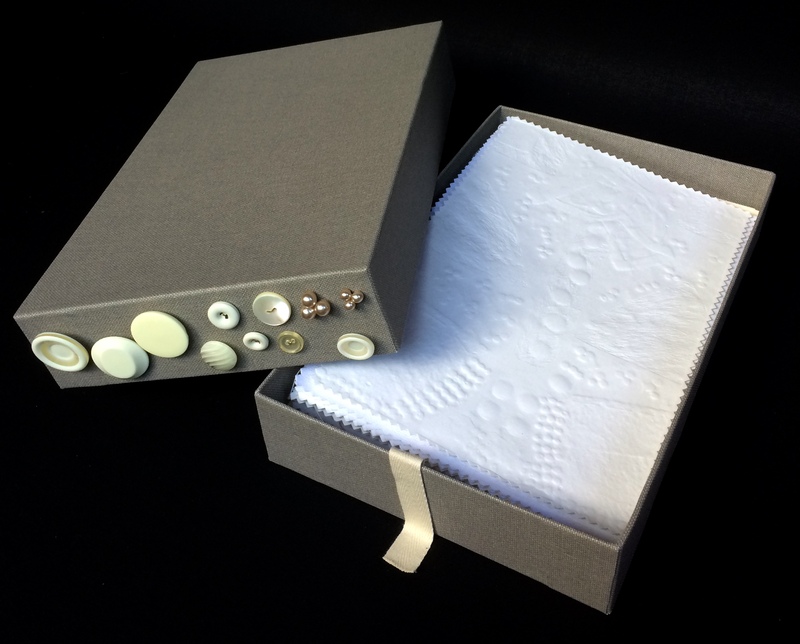 The edition is housed in a handmade archival box, with buttons attached to the front with brass wire and linen ribbon glued inside to facilitate opening the box and removing the work. 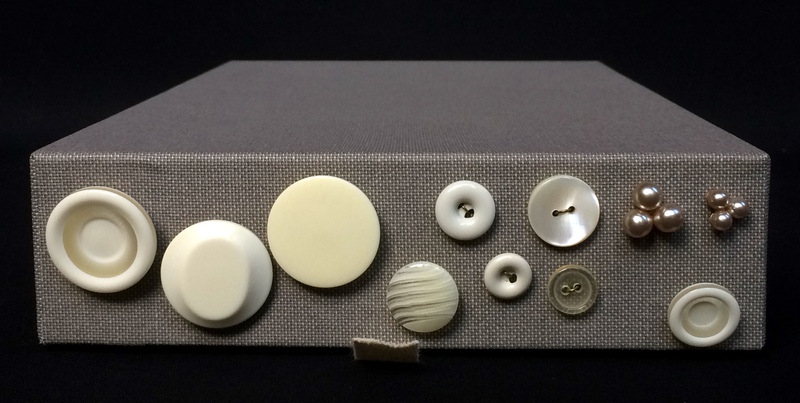 The box mimics the way buttons are displayed and sold in shops, with even a reproduction of an Italian button box label for the pertinent information about the edition on the back.